Joe Pye Weed is a North American Wildflower Native that attracts butterflies and bees with its rose pink blooms from July to September. Eutrochium purpureum grows in the 4 to 5 foot height range. Plant in part to full sun in moist to wet soil areas. Space these tall growers approximately 24 to 30 inches apart for an attractive mass of blooms. Joe pye weed is an excellent size to use as a background in lower, damp soil spaces. Pair your Eutrochium with rudbeckias, Goldenrod, coreopsis, tall ornamental grasses, echinacea and shasta daisies. You'll find these varieties on our perennial plants section, plus are great additions to butterfly gardens. The tight thick flowers on the Joe Pye Weed will give way to beautiful seed heads for the birds in winter. Can't grow the taller Joe Pye Weed? 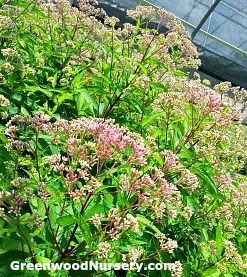 Check out our Dwarf Joe Pye Weed! Caution: all parts of this plant are poisonous if ingested. Joe Pye Weed ships as a one gallon (trade) container grown plant. Orders shipping to AZ and CA will be bare rooted and root washed before being prepped for shipping.